1Eggs Eggs in Italy are sold 6 to a carton and they are never kept in the refrigerated section. They are usually stacked in limited quantities on an aisle’s end cap. Once they are gone for the day—they are gone for the day. At home, eggs from the grocery are stored in the fridge until used for a frittata, cake, making fresh pasta, and the myriad of other things one does with eggs. 2Milk and Cream The higher fat content of whole milk and cream makes them the best choice for cooking. Italians use milk to create besciamella (bechamel) sauce for lasagna or for a sauce to cover filled crespelle (crepes). Cream is used as a simple sauce for pasta and whipped for tiramisù and other desserts. 3Unsalted Butter I prefer to use unsalted butter for everything—which allows me to control the salt content of a dish, and its fresh, sweet flavor is the best for making desserts. 4Cheese There are unlimited varieties of cheese to choose from. In my fridge I tend to keep one of the following three cheeses for grating: Parmigiano-Reggiano, Pecorino Romano, and Grana Padano. These hard cheeses, when stored either wrapped in plastic or placed in a resealable plastic bag, will keep several weeks, if not more. Though more expensive than the “shaky” grated cheese, any of these three fresh hard cheeses will add a tremendous amount of flavor when grated—you definitely get a “bang for your buck” with them. Mascarpone is similar to cream cheese and can be used for sweet desserts or savory ravioli fillings. 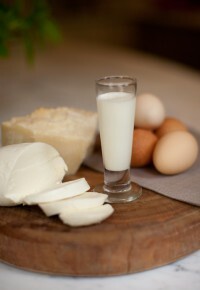 Of course for “ooey-gooey” melting cheeses, there are Fontina, Provolone and the most famous of all ~ Mozzarella. Fresh mozzarella is often found packaged in water, which helps it to maintain a soft texture. In Italy, Mozzarella di Bufalo (Buffalo Mozzarella) is made from water buffalo milk and truly is the best. If you are a fan of blue cheese varieties, Gorgonzola is Italy’s contribution to the list of famous blues. Sometimes it is used in savory dishes, but when paired with honey for a simply rich and decadent dessert crostini ~ Mamma mia, fantastico!